WASHINGTON — Several purported secular, pro-democracy activists are now face three-year sentences in prison. 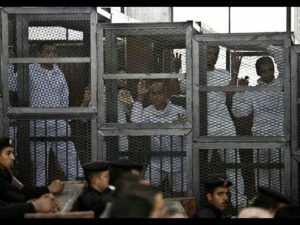 They appealed their decision, but the Egyptian appeals court upheld their prison sentences and jailing. Reuters reported that the three activists, Ahmed Maher, Ahmed Douma, and Mohamed Adel, were sentenced this past December for protesting without permission and assaulting the Egyptian police. Some say that this move is a crackdown by the army-backed government on political dissent and protest, which brought about the toppling and ouster of the Muslim Brotherhood government under President Mohammed Morsi last year. There is a new law, which was tested by this court case, that makes Egyptian citizens seek permission from the police in order to demonstrate. The European Union and the U.S. urged Egypt to reconsider this decision to uphold the prison sentences under this new law. The defendants could appeal to a higher court in the Egyptian justice system.